Win Passes to World Premiere of “THE NUTCRACKER IN 3D” Starring Elle Fanning in Los Angeles on Hollywood Mom Blog! 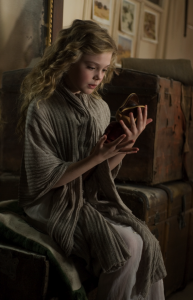 You are here:Home-CHILD ACTORS, Child Stars, Elle Fanning, In the News, THE BUZZ, Top Child Stars-Win Passes to World Premiere of “THE NUTCRACKER IN 3D” Starring Elle Fanning in Los Angeles on Hollywood Mom Blog! Your favorite childhood Christmas story is now a dynamic film in 3D and you can win a chance to attend the world premiere right here on Hollywood Mom Blog! From the imagination of acclaimed Russian director Andrei Konchalovsky, the cherished story of The Nutcracker will be brought to life in spectacular 3D this holiday season and unbelievably will be the only holiday-themed film released this year! 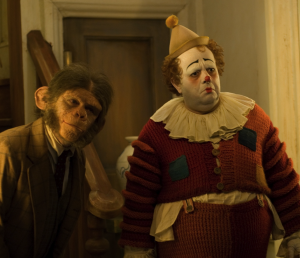 The film boasts a stellar cast (Child Star Elle Fanning, John Turturro, Nathan Lane, Charlie Rowe, Yulia Vysotskaya) and features 8 new songs by Academy Award-winner Sir Tim Rice, each based on Tchaikovsky’s original music. This coming Wednesday, November 10, 2010, *One Lucky Parent and Child will win passes to attend the Red Carpet, World Premiere of “The Nutcracker in 3D,” on HollywoodMomBlog.com. To enter, simply post one of your favorite childhood or holiday memories of seeing “The Nut Cracker” as a child, below in the comment section. Your memories can be funny, touching, or nostalgic! The winner will be notified on Monday, November 8, 2010, via email. Come join me, the Hollywood Mom and my Hollywood Kid Jordan, for the red carpet premiere! *As transportation and lodging are not provided, the winner should be within driving distance of Los Angeles. 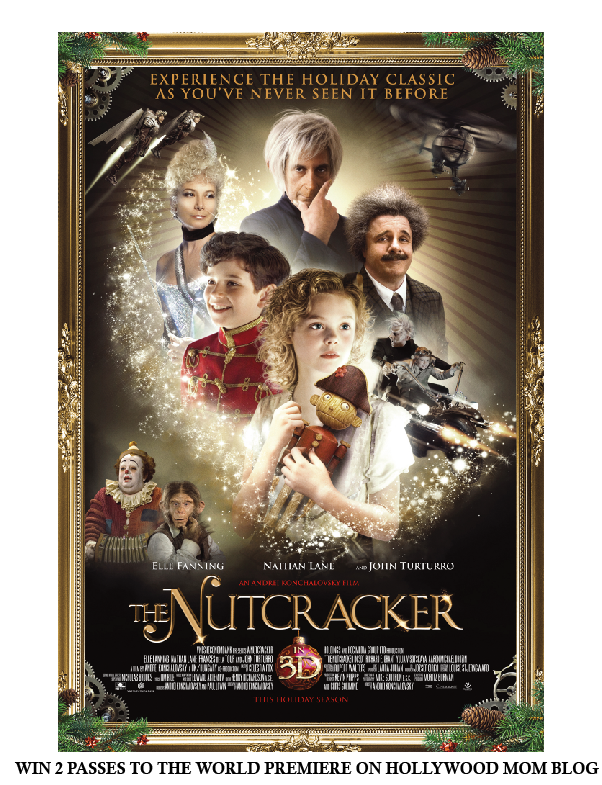 THE NUTCRACKER IN 3D follows nine-year-old Mary (Elle Fanning) whose dull Viennese Christmas is suddenly filled with excitement and adventure following the arrival of her beloved Uncle Albert (Nathan Lane) and his gift of an enchanted nutcracker. On Christmas night, Mary’s new friend, The Nutcracker (Charlie Rowe) or “NC,” comes to life and takes her on a wondrous journey into his magical world of fairies, sugarplums, and other Christmas toys which come to life. Mary soon realizes that this fantastical kingdom is facing danger from the tyrannical rule of the evil Rat King (John Turturro) and his devious mother (Frances de la Tour). When NC is taken hostage, Mary and her newfound toy friends must uncover the secret of the Rat King to rescue NC and his kingdom. Based on the story that inspired acclaimed Russian composer Piotr Tchaikovsky to create the music for the iconic ballet, the film includes eight exciting new songs penned by Oscar-winning lyricist and librettist Sir Tim Rice (The Lion King, Evita, Jesus Christ Superstar). I have great memories of watching the Nutcracker as a little girl! My mom, dad and dog Cricket would get in our pajamas and drive to the drive in Christmas cinema they held each year. Their were lights, hot chocoloate, reindeer and cookies included! It was so much fun! We all laughed, cuddled and watched the Nutcracker in our vehicle on the big screen! I so wish they would bring that back! What an exciting time, especially for the little ones! My dog Cricket (a small yorky) just barked and ate cookies! We went every year to see the nutcracker at Papermill Playhouse in New Jersey from the time that I was 4 until my youngest cousin was old enough to be a solder and party girl in the Nutcracker. I always wanted to be in it, but never went to the right dance school to have the chance to perform. My mom, aunt, grandma, and cousins would all put on our velvet dresses and pile into my aunt’s LTD station wagon. Usually myself and my 3 other small cousins would be packed in the trunk with the older cousins and aunts sitting in the front and middle seats. It was always part of our Christmas tradition to go every year. I would love to take my mom to go see it this Wednesday. She’s flying in from Jersey. The first time that I watched the Nutcracker I was around 7 years old. Of course, after seeing it I wanted a nutcracker of my own. I wanted to try using the nutcracker on some walnuts to bake chocolate chip cookies. Unfortunately, the nutcracker my mother purchased wasn’t very easy to use. After unsuccessfully trying many times and pinching my fingers, I decided to go to my father’s tool shed to crush the walnuts with a hammer. Needless to say, I baked chocolate chip cookies with walnuts and shells in them and nursed some sore fingers for the holidays that year. I actually have never seen the Nutcracker before. But I am going to see this movie for the first time with my daughter and I think it will be even more special because of that. It sounds like a wonderful story. There is nothing that brings back wonderful memories of Christmas for me more strongly than hearing the opening bars of the Nutcracker played by a live orchestra. As a child, I can still remember what it felt like to have good seats so that I could see the performance in its entirety. Retson my 12 year old son has just started taking Jazz, Tap and Hip Hop Dance classes and has never seen this cherished production. What a wonderful way to introduce him to this memorable Christmas tradition story by attending this Red Carpet World Premier Event of The Nutcracker in 3D Movie. What a great unforgettable way to start the holiday season for a mom and her son. I will never forget the first time I saw the Nutcracker live. I was 9 years old, in the 4th grade. My family had just moved to the US. I barely spoke English. I went on a class trip to see the play that first holiday. Although I couldn’t communicate much with classmates and didn’t have many friends, I didn’t need to speak English to enjoy the show. The performance spoke to me. I remember being so mezmorized by the beauty of the performance. The music and dancing was so impressionable. That day was so special because I saw my first live performance- something my parents would have never been able to afford to get me. When I grew up, I started to make it a tradition to go see the Nutcracker during the holidays. I hope to continue this with my daughters. November 10th is my daughter’s birthday and it would be so special to take her to see the Nutcracker. I remember seeing The Nutcracker as a child with my parents. I use to collect a nutcracker every Christmas after seeing the movie. I passed my collection onto my niece I have been looking to start a tradition with my 5 year old son for the Christmas time. I think this would be a wonderful opportunity to pass along something I did as a child. I have such fond memories of seeing the Nutcracker every year with my Dad in New York. It was our special thing we did together. I have been carrying on the tradition by taking my six year old daughter each year since she was three. It is one of her favorite holiday traditions. We are both so excited to see this wonderful ballet adapted into a move and played out on the big screen in 3-D no less! I actually never saw the Nutcracker as a child. The first time I saw it was when my daughter was 3yrs old. We lived in Nevada and every year the High School would put on the Nutcracker around Christmas time. When she turned 3 I thought that was the perfect time to take her. We got all dressed up, went to dinner and then went and saw the play. It was our thing to do together and we did it every year until we moved back to California. It has been 4yrs since we have seen the Nutcracker and to this day she still asks when we are going to see it again. It would be such a wonderful prize to win so hopefully we get picked. Thank you !!! I’ve never seen the Nutcracker and would to be able to take my daughter. This would be so special to both of us! I have been taking my seven year old daughter to the Thousand Oaks theatre for the past couple of years to their showing of the Nutcracker. Her favorite part is getting to meet and talk to some of the actors after the show. She would be so enthralled with them and their beautiful costumes. I have never seen the nutcracker and have always wanted to but never had the chance. i would like to start a christmas tradition with my daughter and this would be a great one to start. My grandmother owned a dance studio in Seminole, Oklahoma. Her dream was for me to embrace dance but I didn’t like the shoes (and have been told I share her rebellious spirit). My father took me to the holiday performance of Nutcracker with the “big girl” classes. I was mesmerized! That night I put on my brand new pink ballet shoes for the first time and soon thereafter joined grandma’s beginning class. My memories of that night and the subsequent time with her as my teacher will stay with me forever. Now I have a 5 year old daughter. She attended exactly one dance class and has refused to return. I would hope that experiencing the magic of the Nutcracker will encourage her to try on the pink shoes again! The first time I ever saw the Nutcracker was when my daughter, who was 5 at the time, was performing as a mouse in this wonderful and amazing story. I’m embarrassed to say that I was filled with so much joy during the show that I wanted to cry. 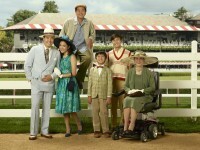 The story, characters, music, dancing were all so beautiful and exciting that I couldn’t look away for a moment. I was so proud of my little girl for being a part of this magical Christmas Eve. I knew right then that I had missed out not seeing this as a child and that it was to become our newest holiday tradition. My daughter has since then continued with the dancing and every year we look forward to see the Nutcracker…Daddy and Little Brother also join in on the tradition. This show kicks off the Christmas Season for us, our favorite time of the year! It’s here – Thanksgiving and Christmastime – and building memories for our families. We would love to attend The Nutcracker this year with our kids! !